Luca Bressan started his career designing and building motors for competition motorbikes and robots for the eyeglass industry. Bressan also designed machinery for the production of snowboards, which he produced for a short period, until he specialises in the design of office chairs. Bressan’s designs are characterised by their great form and functionality. 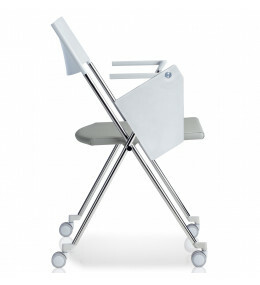 Strym Visitor Chair can be stacked or used as beam seating. With optional writing tablet and castors.